Monica Prelle shares her shoulder-season route picks, along with logistical info to get you started. 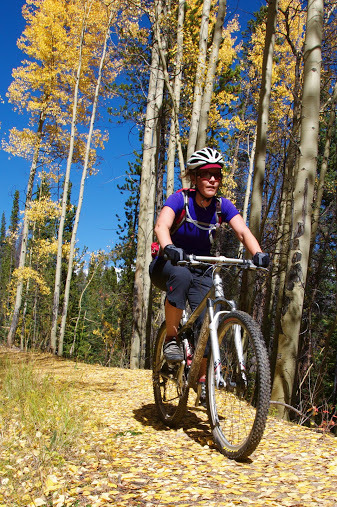 THERE ARE 100+ MILES of trails in Breckenridge, including both a tightly packed in-town network and sections of some of the region’s most epic trails. Riders of all abilities will be able to put together a sweet route. Here are 4 of my favorites. Ask a local and they’ll probably point you to Peaks Trail as the quintessential singletrack in Breck. It’s a technical climb with rock gardens, bridges, almost 1,000 feet of elevation gain, and a ripping-fast descent. Along the way you’re likely to see red-tailed hawks and stellar jays. The trail winds through tunnels of aspen trees, opening onto some sick mountain views. Start in town and pedal up Ski Hill Road to the Peaks trailhead. You’ll head uphill on Peaks Trail for about 3 miles before the grade mellows and you begin to traverse the mountainside. The trail passes the Gold Hill / Colorado Trail junction and continues downhill to Frisco. At the trail’s end, turn right on Miners Creek Road, then right again onto the paved Blue River recreation path and follow the signs back to Breck. For a shorter loop, head up Ski Hill Road and take Peaks Trail to the Gold Hill / Colorado Trail junction at 4.8 miles. Turn right on Gold Hill Trail and follow it to the paved Blue River recreation path to return to town. My first afternoon in Breck, I decided to sneak in a quick ride before dark. The Sallie Barber / Barney Ford Loop was recommended, but rather than follow the directions, I pedaled straight up Carter Park Trail and later realized I was riding the loop backwards. I eventually got myself turned around and on the loop going the right way. You’ll be traveling on surface streets and dirt roads for a few miles to start with, which makes the uphill pedaling relatively easy. Once you reach the top of Sallie Barber Road, you’ll have a lot of fun singletrack options back to Carter Park. From the Carter Park parking lot, head north on High St. for five blocks. When High St. dead ends, turn right onto Wellington Road. Take Wellington for about a mile and then bear right at the Wellington / Reiling / French Gulch Road intersection. Continue up French Gulch for 2.9 miles to the Lincoln trailhead. Just past the trailhead kiosk, turn right onto Sallie Barber Road and head uphill for 1.2 miles to the Sallie Barber Mine. Follow Barney Ford to Moonstone Trail, then to Carter Park Trail back to the park. The trails out of Carter Park were so much fun I returned three times in four days. I found the dirt fast and flowy, and there are nice views of town. The network of trails in the area offers a few different loop options and out-and-back rides. The Carter Park network is also popular among trail runners and dog walkers; these different user groups seem to happily coexist. For a short but solid ride, head straight up from the Carter Park trailhead to the top of Barney Ford Trail. This is also a good alternative to the Sallie Barber Loop for those who prefer riding only on singletrack. The descent will be the same, but the uphill climb is much steeper and shorter. Take Carter Park Trail from the trailhead at the parking lot and pedal up the steep switchbacks for .5 miles. Take Moonstone Trail up for another .5 miles. Next, take Barney Ford Trail for 1.5 more miles of up. Return to Carter Park the same way you climbed. After four days exploring Breck, I hadn’t got my fill of riding, so I set the alarm and hit the trails before sunrise on departure day. The bike valet guy at my hotel recommended Burro Trail; the trailhead was close by, so it was a good option for squeezing in one last ride. This out-and-back is a mix of double and singletrack and is a good one if you’re short on time or want to grab a few extra miles after a day of riding. The trail follows a creek most of the way up and has a few rock gardens for more challenging terrain. Most people take it for about 3 miles before turning around, but there are options to continue on a more technical trail. Start at the base of Peak 9 and head up the dirt road for about 100 yards. The trailhead is marked with a forest service sign and is easy to spot. The trail winds uphill and eventually crosses a 4WD road at about 3 miles. Turn around and descend the same way, or continue up for a longer and more technical ride. Peak 8 Fun Park has more than 20 miles of downhill singletrack accessible by chairlift. The park was already closed for the season when I visited in late September, but the crew was working hard on trail building and maintenance and is excited to showcase some new trails next summer. Bike park lift tickets cost $15 for one lift or $30 for unlimited rides. Bike rentals at Alpine Sports — one of several shops in town — start at $25 for a half day on a Specialized hardtail, $35 for a full day; $45 gets you a half day on a Specialized full suspension, $55 for a full day. The shop has four locations in Breckenridge and also rents road bikes, cruisers, tandems, kids’ bikes, and child trailers. Download a free trail map before you visit, or purchase the Breckenridge & Summit County Hiking and Biking Trail Map at any area bike shop. There are “mud-o-meter” signs posted at most trailheads; use good judgment and stay off muddy or closed trails.